It has been only a few months since the gala launch of Sheraton Hotel in Hyderabad, and already there is quite a buzz about the place. The buffets and the brunch at Feast have already made their impressions on the discerning food lovers. In December, the hotel has added one more feather in their cap with the commencement of operations of InAzia Chime, a new dining option serving delicious food from the orient along with some rare cocktails. InAzia Chime can actually be called a combination of two distinctly different restaurants. Chime, the lounge bar serving drinks has darker interiors with comfortable seating. 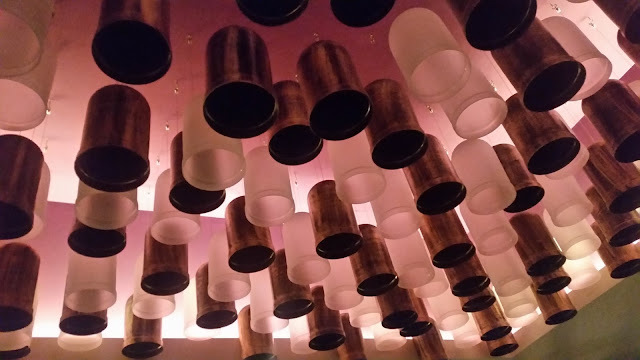 The décor has cylindrical objects of different colors hanging down from the ceiling, giving it a very different look. InAzia, on the other hand, is a brightly lit place with oriental looks. Your attention is automatically drawn to the colorful vases tastefully displayed at the centre of the restaurant. Invited to a Bloggers’ Meet at the restaurant, we were first taken to the lounge area. Here we met Amy Shroff, Flair Bartender and Mixologist. Amy, who is among the few well-known female mixologists in India, is available at Chime on Thursdays and Fridays, where apart from tasting some very innovative drinks prepared by her, you can enjoy her juggling and flaring displays. 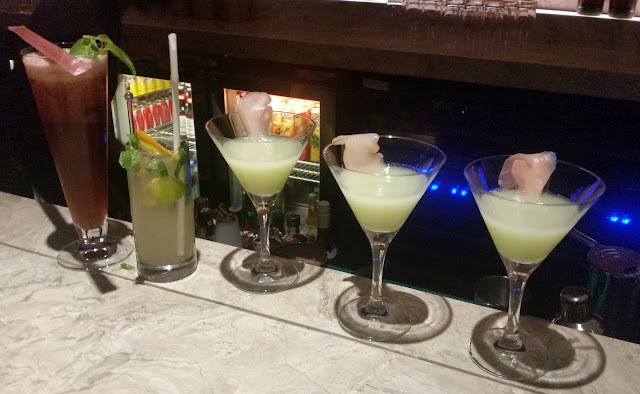 For us she prepared a Wasabi Martini, a drink with more than a dash of wasabi and a strong but enjoyable aftertaste. The jewel in the crown was the next drink called Bell Pepper Martini, where the drink was served in red or yellow bell peppers. The third one I had was a Japanese Mojito, served with a bok choy leaf. All the drinks were unique and went well with some delicious finger food served with them. As interesting was her juggling display with a crystal ball. The starters we had the drinks with came from the oriental kitchen at InAzia. The pick for me was the Crispy Fragrant Duck in Hoisin Sauce. 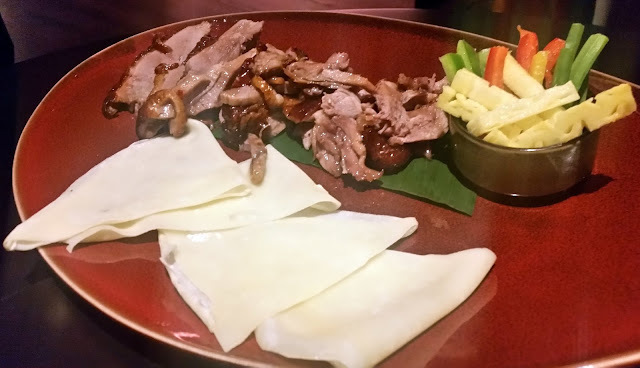 The duck was surprisingly soft, and the portions with the hoisin sauce glaze were especially tasty. 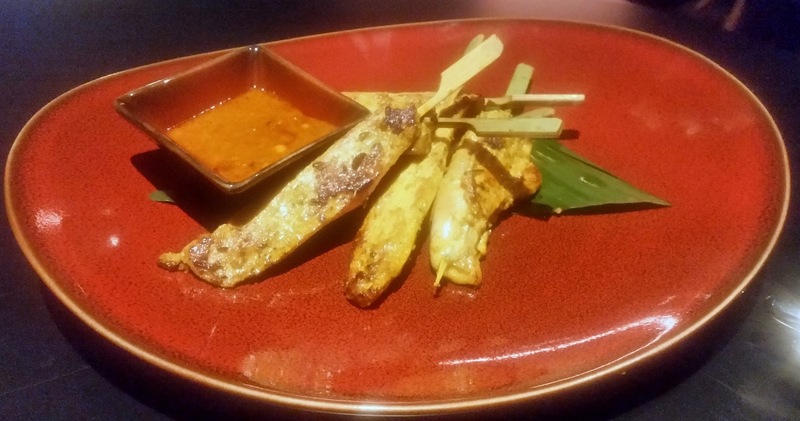 The peanut sauce served with it enhanced the taste of the Grilled Chicken which was served on sticks. The Steamed Crystal Shrimp Dumpling was generously stuffed and went well with the sweetish chilli sauce. At this point, we shifted to the well-lit InAzia area and met Chef Ninja Suksamai, the food curator of the restaurant. 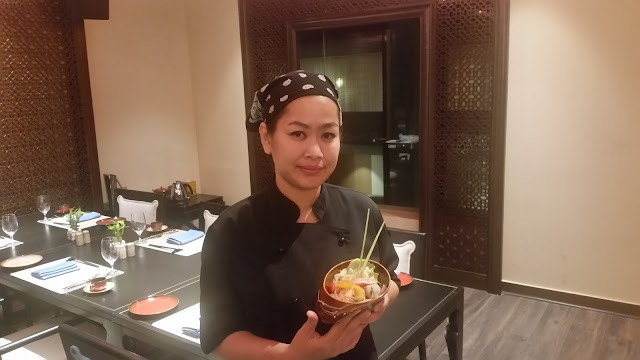 Chef Ninja who is from Thailand, is an expert in oriental cuisine, and has put together select dishes from China, Japan and South East Asia, adding her own twist to some of them. We started our innings at InAzia with some California Sushi Roll with crab meat. The second version of sushi served had salmon, and as I put them in my mouth, the flavours of fish meat burst in my palate. If you are the salmon lover, you must try this dish. 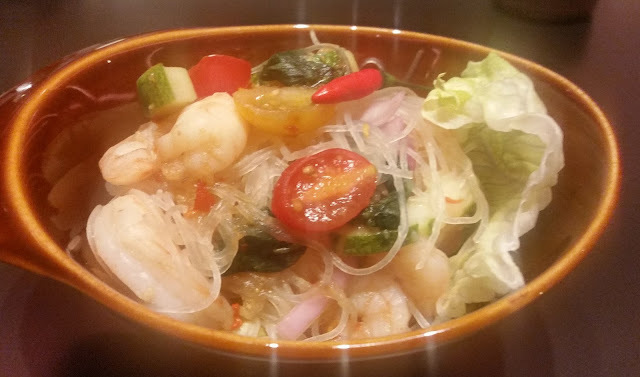 Among the salads, the Thai Goong was my favourite, with glass noodles, prawns, tomatoes, vegetables and flavour of lemon grass. 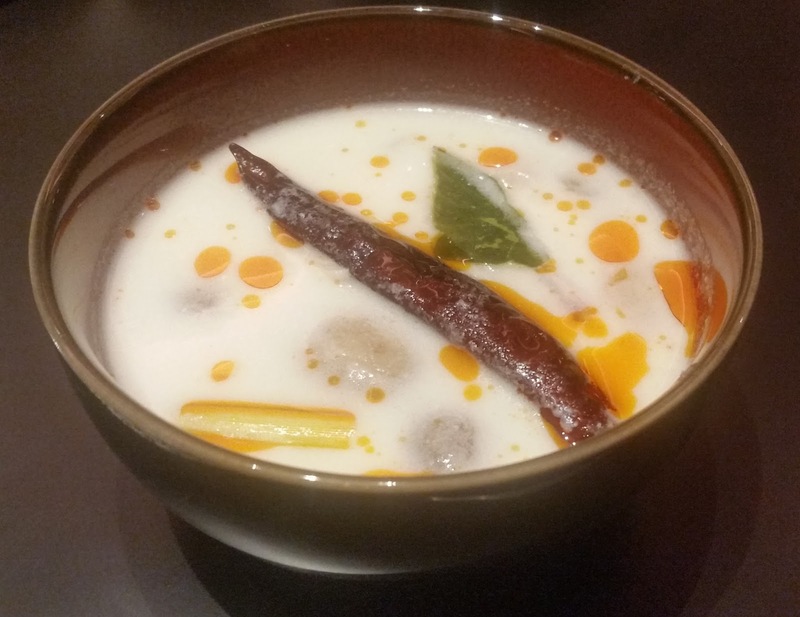 The Tom Kha soup looked quite thick, but on tasting, I found the taste amazing with the combined flavour of coconut milk, galangal and kaffir lime. Over to the main courses. 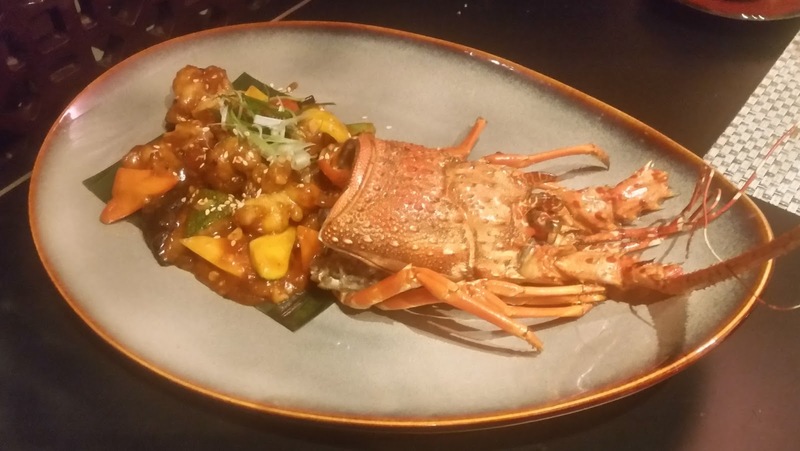 The Goong Mung Korn Pad Cha (Stir Fried Lobster with Tamarind Sauce) looked awesome on presentation. The taste was quite close to the Indian version of oriental cuisine, which I am so familiar from my Kolkata days. The Thai Vegetable Green Curry was the best of the mains. The XO Fried Rice had shrimp and chicken in a spicy and aromatic sauce and I tried it out with the Deep Fried Shell Crab. The crab for me was a little bit over fried, but I liked the taste of the basil and chilli based gravy. 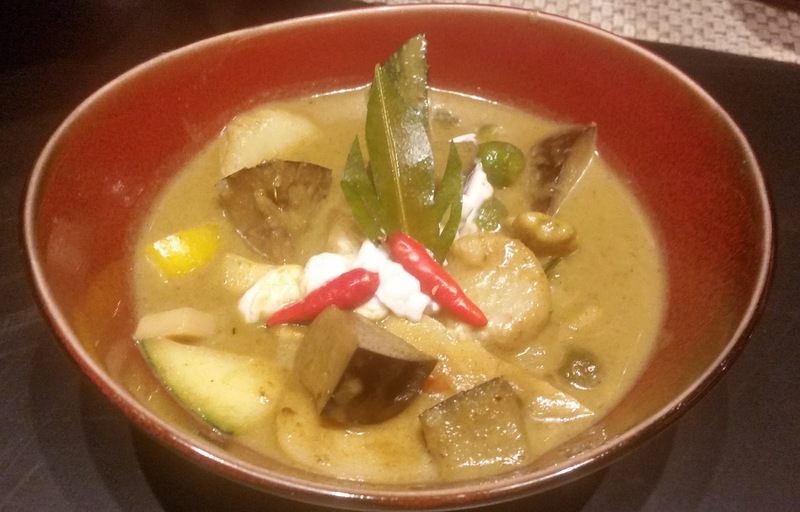 The Thai Lamb Massaman Curry, the signature dish of Thai Muslims was well appreciated. 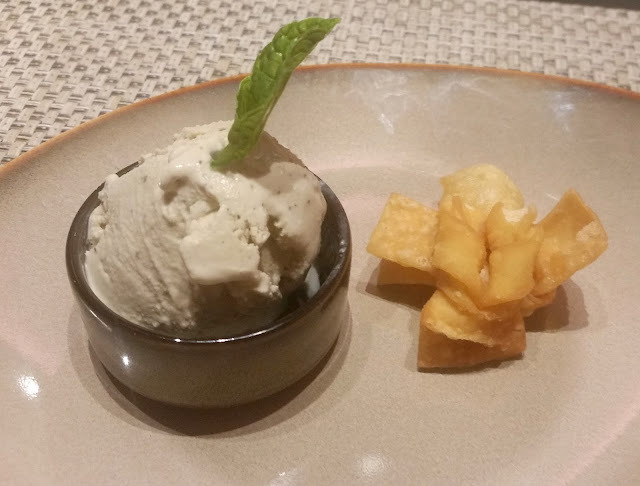 The dessert served was Honey Noodles with Coconut Ice Cream, which I am not particularly fond of. My friends enjoyed it. When Chef Ninja came across from the open kitchen to explain the different dishes to us, one could see her passion for the cuisine. We can look forward to many more interesting dishes from her in future. An evening at InAzia Chime will definitely be a rewarding experience with the signature cocktails and the flavourful Asian food. The place is on the tenth floor of the building, and provides a grand view of the Gachibowli area. Very interesting post with mouth-watering pictures. 'Bell Pepper Martini' presentation is very attractive!